Ninjatoes' five versions of the papercraft LEGO Forestmen are now available for download. There's black, red, blue, and the leader (Robin Hood) with either a yellow or a white feather. 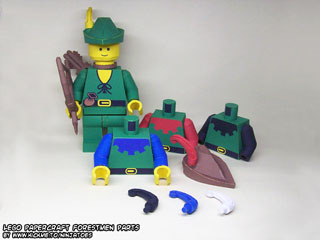 The Forestmen were one the various factions of the Castle theme and were introduced in 1987.